For yachties Bergen is a lovely harbor to sail into; however, we’d heard from several other cruisers that it’s also a huge party place, especially on the weekends. One boat said they had people stomping over their boat throughout the night and wee hours of the morning while blasting music in spite of quietly asking them to turn it down a bit at 3:00am. The response was even more galavanting across their deck and increasing the volume of their music. So, we were extremely glad not to be experiencing that, especially since we never would have met Elisabeth and Gunnar in Os if we had continued sailing to Bergen. The bus was an easy jaunt where we met a woman who had brought her dog aboard. When I said he looked a bit tired, she said he was missing his morning sleep. The pup just rolled his eyes at me then soon slumbered off. We managed to get some sun when we first landed in Bergen (a rarity as we discovered it is true that you’ll get two days of rain for every one day of sun here). Immediately we walked to the Tourist Information (TI) office and became part of the crowd of tourists inquiring about sites, bus routes, and special events. We purchased the Bergen Pass, opting for the 48-hour one, which would cover our planned two-days sight-seeing. Bergen was founded in 1070 c.e. by the King of Norway, Olav Kyrre, who happened to be the son of King Harold Hadrada who died in England at the Battle of Stamford Bridge in 1066. Nestled into an arm of a small fjord it was the largest town in the late 11th century and the capital of a region encompassing Iceland, Greenland, and parts of Scotland (the Shetland Islands use to be part of Norway, which is why some say it’s more Norwegian than Scottish). Bergen continued to prosper even after Oslo became the capital in 1299. And, it was this rich trading period that became our focus during our first day in this city. We made a beeline for the Bryggen (Wharf) Area across the harbor from the Tourist Office. Here the medieval German enclave was built by and for the German traders representing the wealthy Hanseatic League (aka Hansa, which comes from the Gothic word for ‘gang’ or ‘band or men’). I was eager to learn more about this merchant guild after our spring touring of some of the Netherlands’ ports featuring the Dutch East India Company, the Hansa’s rival and later successor in monopolistic trade. The Hanseatic League formed out of German merchants’ desire for safe shipping routes while negotiating favorable importing/exporting pacts with key towns and cities. Bruges, London, and Bergen became prominent trading posts or Kontors with local rulers agreeing to grant the Hansa special privileges. For example, in 1266 Henry II allowed the Hansa to trade at fairs throughout England while giving those merchants toll-free access to London. Of course the favoritism shown to these foreign merchants irritated their English peers; and, in 1597 Elizabeth the First expelled the League from London; but, that’s after 300 years of surely a sizable profit for the Hansa guys. and obtained a sense of how these ex-pats lived in Bergen, absorbing the medieval atmosphere. We peered skyward as we walked through the narrow alleys separating the trading houses, all crammed together facing the harbor. Today they’ve been renovated and/or rebuilt, but even with a great coat of paint, I’d get claustrophobic. As an all-male population the schotstuene or assembly room became the focal point for all sorts of activities. Functioning as a gathering place, the schotstuene served as a dining hall, place of festivities, an office, a court, and a school for the apprentices. 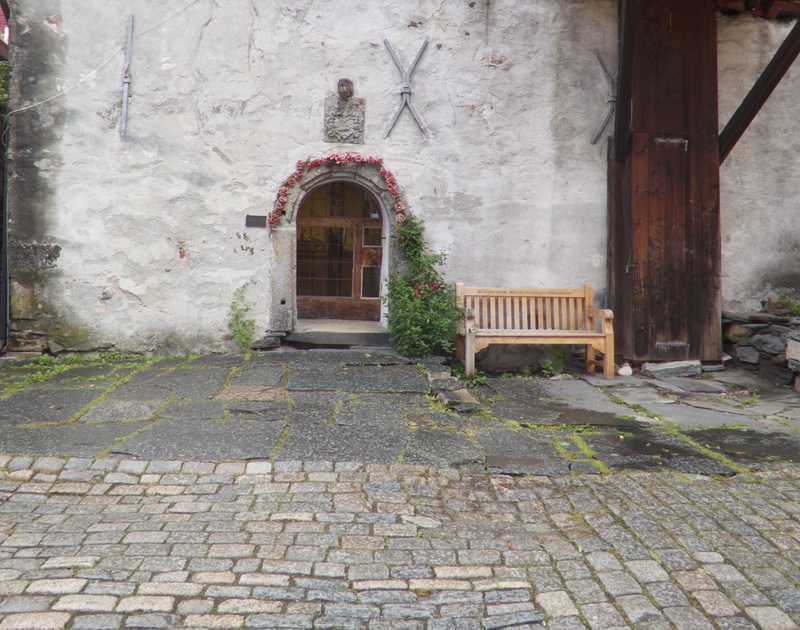 In Bergen we toured one of these establishments comprised of original and reconstructed buildings where Germans congregated during the Hanseatic years for approximately 400 years beginning in 1360. Yucky initiations occurred here as well with the poor newbies, i.e., apprentices, hazed by the older members during the “Games”. One of these initiations involved hanging the apprentices upside down over a smoking fire where tanning waste (from curing hides) were being burnt. Sounds horrific, but, there’s more: As these poor lads were suspended head down, the better to inhale the foul smoke, they had to answer questions while being beaten. We saw the room where this occurred. Nice, huh? The schotstuene was a popular place to congregate because it also was the only building where an open flame was allowed in the entire enclave (!). (Like most towns and cities in Norway, Bergen had a history of going up in flames multiple times over the centuries due to their timbered structures.) This meant the trading houses and warehouses where the merchants, their journeymen or overseers, and apprentices worked and slept did so without the benefit of candles or heat. And, no, they weren’t allowed to sleep at the schotstuene. And, this is in NORWAY where it can get mighty cold. AND, they weren’t allowed female companionship. Definitely, a tough winter. But, money is money, and up to 2,000 Germans lived in Bryggen. Merchants, the top of the pecking order, were required to purchase a house here; yet, they usually returned home to Germany leaving a manager (a promoted journeyman) to carry on the business. Bergen’s Hanseatic Museum located in one of German merchant’s houses offered a fascinating look into this world. one room showing the beds for the apprentices (no flash allowed so not the best pics). The league remained a loose federation of merchants as opposed to becoming a centralized political alliance. Not to say they didn’t have power. Anyone familiar with US politics understands the relationship between money and decision-making. In short, you’re screwed if you don’t have money to throw at the feet of those in power; or, really, if you can’t toss it to those who are paid to influence those in power. Eventually over 100 municipalities were members of the Hansa with its first Diet or assembly held in 1356. As in Bergen and other Hansa ports, these German merchants established tariff agreements, including setting the prices of goods. The League used both the carrot-and-stick approach to business: guaranteeing a profitable market for a trading partner’s goods (stockfish in Bergen’s case) while threatening to withhold critical delivery of goods (such as grain) if there appeared an unfavorable glitch in the negotiations. In the 15th century the forming or reviving of nation-states created an opposing force to the Hansa whose power was derived from alliances with much smaller and less powerful city-states. The Dutch exemplified this evolution with Bruges, Antwerp and Holland becoming one country, the Duchy of Burgundy. They were able to circumvent the trade routes of the Hansa by trading directly with non-Hansa towns, charging lower freight costs. Additionally, the Dutch began to poach the Hansa’s shipbuilding market, which Lubeck and Danzig had cornered over over the centuries. By the 16th century the Hansa had weakened considerably and limped. By 1669 only three member cities remained (Lubeck, Hamburg and Bremen). Those three cities remained members until 1862 when the Hanseatic League ended. The museum was fascinating and offered much more detail than I’ve shared here–the process of receiving, preparing, and sorting the stockfish for export, the lives of those sailing on the ships, the elaborate city seals used for official business, for example. Well-worth an extensive visit. After immersing ourselves in the Hanseatic League we ventured out of this sub-city where we heard the sound of marching feet. Quickly we located the source as a group of uniforms past us in unison on their way to the main square. We followed this rhythmic centipede to where this military group, the Hans Majestet Kongens Garde (His Majesty’s the King’s Guards) had set up for a noon concert. The crowd loved it, as did we. The music added a greater element of festivity to our first day in Bergen. That, along with some hair I spotted. If I were a lot younger, I think I’d try out this color myself. It’s glorious! After hearing the band and munching on our picnic lunch we returned to the waterfront where we scouted out a chandlery for a fuel additive (the same one the Coast Guard Organization gave Max in Egersund), then returned to the Bryggens area to visit the Bryggens Museum. and a sobering exhibit on the great fire of Bergen on January 15, 1916, when a candle flame ignited a bale of oakum (tarred fibre used as ship caulking). Exiting the museum we headed for the harbor entrance where we poked around Bergenhus (Bergen’s Castle). We stepped inside the royal apartments housed in a building constructed by King Haakon Hakonsson between 1247 and 1261. 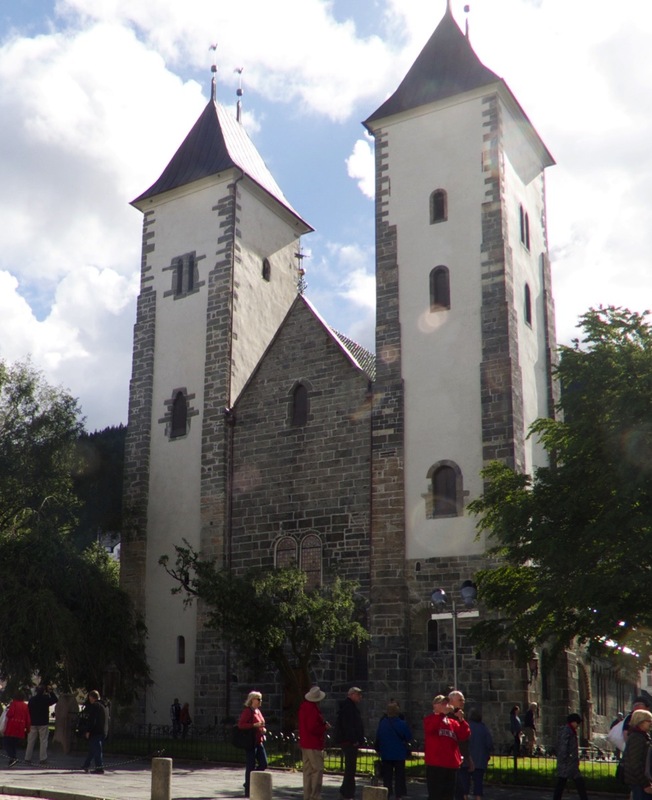 Haakon’s Hall is the largest, secular medieval building still standing in Norway. Destroyed in 1944 by a German ammunition ship, which left only the outer walls standing, this beautiful hall was rebuilt and restored a second time. And, it is beautiful. Several interesting stories are attached to this Renaissance building. One involves the Battle of Vagen on August 2, 1665. I won’t go into details but it’s a fascinating tale of how this city got stuck in the middle between two maritime powers, the Netherlands and England. Another historical footnote is the trial of Anne Pedersdatter on March 21, 1590. Accused as a witch she was subsequently found guilty and executed by fire. Gruesomely, they tied witches to a ladder and placed it on the bonfire to ensure they died by the flames versus by smoke inhalation. The thought was the fire would cleanse the soul and improve the convicted’s chances in the afterlife. Frankly, I’d prefer death by smoke and to hell with the afterlife bit. Finally, both her name and Rosenkrantz’s may sound familiar since both have been used by playwrights, one being William Shakespeare who paired Rosenkrantz with Guildenstern in “Hamlet”. we called it a day and returned to Os. This entry was posted in 2016 07 NORWAY - South, 2016 Summer Cruising, COUNTRY, Europe, Norway, SUMMER CRUISING on July 18, 2016 by margaretlynnie.